The new cannabis dispensary focuses on supporting local, independent businesses. Hi Fidelity is the perfect antidote to corporate cannabis. Finally, you can buy some of the world's dopest vinyl and best cannabis under the same roof. Socially conscious weed shoppers will be able to support an independent and intentional marijuana industry at Amoeba Records' new recreational pot shop, Hi Fidelity, at 2465 Telegraph Ave. in Berkeley. Located in Amoeba Records' former jazz and classical section and owned by legendary record retailers Marc Weinstein and David Prinz, Hi Fidelity hosted a grand opening with a ribbon-cutting ceremony by Berkeley Mayor Jesse Arreguin on May 12. It's arguably one of the best cannabis retail locations in the country, just blocks from the UC Berkeley campus. From the check-in experience to the product displays, the smelling station, the decor, and the soundtrack, it's apparent that Amoeba Records has successfully ported its 28-year-old independent retail ethos into the weed business. 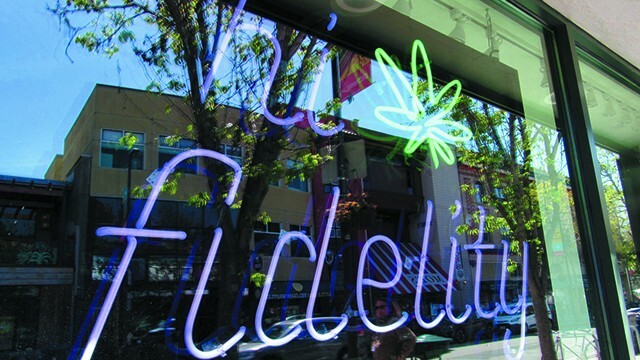 Hi Fidelity offers East Bay shoppers the perfect antidote to modern corporate cannabis. Hundreds of millions of dollars of global private equity is flooding into the weed industry, creating antiseptic pot stores with interchangeable menus from San Diego to Sacramento. Not so at Hi Fidelity, where lead buyer Chris Garcia has hand-curated a lineup of more than 100 products that come from companies that mirror Amoeba Records' values: local, minority- and women-owned companies specializing in high-quality, small-batch, sustainable products. For example, Korova edibles dominate shops in California, so instead Hi Fidelity went with family-owned Santa Cruz edibles maker Big Pete's Treats, which regularly hosts beach cleanups. Hi Fidelity also carries vape pen brand Bloom Farms, which buys a free meal at a local food pantry for every vape pen sold; infused bath soaks by women-owned East Bay collective Om Edibles; and Sunboldt Grown flowers, which are dry-farmed to promote healthy rivers and watersheds amid unprecedented takings by the marijuana industry. Garcia said he personally visited and vetted each one of their vendors' farms, sometimes helping clear timber on private roads to reach the goods, he said. "It was that kind of thing," he said. "It took me a long time to vet some of these companies." The inside of Hi Fidelity also does its best to marry Amoeba's funky, idiosyncratic style to the state's rigid weed rules. Hi Fidelity's roof looks like piano keys and is an extension of the Amoeba Records building. Inside Hi Fidelity, things are lighter, crisper, and cleaner than the cavernous, highly decorated Amoeba. "It's not an Apple Store, but it's not marijuana leaves and exposed breasts and all that," said Prinz, Amoeba Records' co-owner. Polished concrete floors give way to white walls with framed art like a Louis Armstrong painting by R. Crumb. Amoeba's signature steel fabricator created the club's green display cases. Above, skylights let in gobs of natural light, and sound dampening ceiling tiles help mute the huge space. Jazz plays softly from the speakers as folks peruse detailed write-ups on each product, quiz floor staff, and sniff wares at a smelling station in the corner. Hi Fidelity wanted to mirror Amoeba's low-stress retail experience, allowing customers to browse, ask questions, and then get in line and pay when they're ready. "I always felt a lot of pressure if I get to the front of the line and I ask for my strain Jack Herer and they're out and now they're showing me different stuff and there's that pressure of people behind you to buy fast and decide fast," Prinz said about his experience at other cannabis shops. Hi Fidelity's opening is also a triumph of redevelopment for upper Telegraph Ave., which "is better than it's been in years," said co-owner Marc Weinstein, who first began working on the block in 1980. "I think this is the missing piece of the block," said Prinz. "Berkeley has been the easiest to deal with, out of anything we've done. ... I never thought I'd be part of another ribbon-cutting on this street." It almost didn't happen. After the club lost a grueling battle to win the city's fourth dispensary permit in 2016, Councilmember Kriss Worthington convinced the city to add extra permits. Amoeba's owners got the fifth permit, and spent 18 months and an estimated hundreds of thousands of dollars to open the shop, including installing two titanium security doors costing $50,000 at the request of the Berkeley Police Department. All building activities are recorded on camera — quite the antithesis of the free-wheeling record business. Weinstein and Prinz seemed a bit shocked to be wearing security badges after all these years. "There is an amazing amount of red tape and paperwork, way beyond the normal course of business for a retailer. You got to have amazing willpower and experience," Prinz said of the difference between selling vinyl and herb. In the future, profits from Hi Fidelity may go toward releasing some newly remastered Louis Armstrong albums that Amoeba owns, Prinz said. Or maybe opening another dispensary in San Francisco. "We'll see how we like doing this," he said. Award-winning journalist and best-selling author David Downs writes Legalization Nation weekly. He is the co-author of Marijuana Harvest (2017). Find Hi Fidelity shopping picks like Madrone Farms' Do Si Do on his podcast website, TheHash.org.